Willard Robison is best known in jazz circles as the composer of the standard “Old Folks”. Otherwise, he is sadly forgotten, with a catalogue that never made it out of the 78-rpm era. In the liner notes to this inspired set of Robison songs, guitarist/vocalist Matt Munisteri ponders Robison’s obscurity and touches on larger historical questions of art and commerce. The notes alone are a scholarly achievement, but it’s the music that makes the case for Robison’s genius. 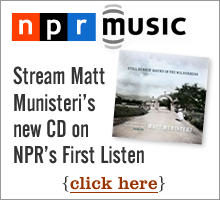 Munisteri’s guitar language is razor-sharp and deliciously old-timey and his drama-free vocal delivery – worlds away from the blues-soaked growl of a Doug Wamble, for instance – helps to draw out the wry storylines in the lyrics. Bassist Danton Boller and drummer Ben Perowsky supply expert rhythm while pianist Matt Ray gives the harmony a legato element, balancing the leader’s percussive guitar. The solos and textural flourishes of trumpeter Jon-Erik Kellso are essential. Scott Robinson’s C melody sax on the ballad “Heard a Mockingbird Singing” is a thing of wonder. Early jazz is Munisteri’s touchstone: “A June of Long Ago” features guest vocalist Rachelle Garniez sounding not unlike Adelaide Hall on Ellington’s “Creole Love Call” (while Robinson does his best Barney Bigard clarinet). Munisteri scales down to voice and guitar for the moving “Little High Chairman”, not long before the band erupts in a hot ’20s vein on the instrumental “Hurry Sundown”. By contrast, the closing treatment of “A Cottage for Sale” would fit on a John Lennon solo record. “Moonlight Mississippi”, a straight jazz ballad in Rosemary Clooney’s hands, turns into a midtempo rocker worthy of Levon Helm. “’Taint So, Honey, ’Taint So”, an ancient vehicle for Bing Crosby with Paul Whiteman, is slowed way down and stretched out, with a magical piano solo over a stately vamp. Despite the numerous liberties taken, Munisteri preserves all the intended charm of numbers like “We’ll Have a New Home in the Morning” and “Truthful Parson Brown”. In a perfect world, those two songs alone would have established Robison as a national treasure.